Chairman Kim Seok-dong of the Financial Services Commission (FSC) said the commission will substantially relax financial regulations to help the growth of investment banking and hedge funds, which can make high profits in diverse areas of the financial market such as derivatives and foreign exchange. In order to create a large investment bank (IB), the FSC is considering an idea to split Woori Securities and Investment Co. from Woori Financial Group and have a large securities and investment firm take over Woori Securities and grow it as a super-large IB. During an interview with media on the occasion of the two-year anniversary of the introduction of the new capital markets law, Chairman Kim said the structure of the financial industry has been solidified enough in the past two years that it could withstand any financial impacts and he means to ease the financial regulations further so as to allow for a “big bang” in the financial market. Kim recalled that the new capital market law was introduced to build a base for strong growth in investment banking and other financial activities, but failed so far due to the global financial crisis and the shortfall in the financial reform law. He said the financial firms focused on stability and conservative means of operations to cope with the financial crisis in explaining the background of the dissatisfaction with the development of the financial market since the introduction of the new capital market law. The FSC chairman said in the past the government led the financial market regulations changes, but this time it will be the private sector that will play a key role in the changes to be made in the financial market regulations. He said the ultimate purpose of the move to ease financial regulations is to let private equity funds grow as large as they can in Korea so they are big enough to operate globally, as deregulation would go as far as allowing PEFs to use market leverage so that the financing function would work smoothly. The government would like to see large hedge funds emerge in Korea through deregulation so that they will be able to compete with foreign hedge funds operating and reaping large profits in Korea. The deregulation will be big enough to remove the limits on hedge fund investments in corporations, which now stands at 50 percent of their available funds. It will also include the expansion of the leverage ratio, which currently is limited to 300 percent of the fund’s assets. It will also do away with the limits on investments in derivatives, which is currently limited to 100 percent of total assets. It will either be removed entirely or expanded further. Hedge funds make up a key part of the financial market with all kinds of investment functions and techniques playing a special role in advancing industrial restructuring and developing high-tech financial techniques, although they sometimes were criticized as too speculative. The key element in the development of hedge funds is the leverage ratio, which is non-existent in many advanced countries led by the United States, allowing the hedge funds in those countries to borrow as much as they can and invest the funds for high profits. For example, a hedge fund in an advanced country with no limits on leverage ratio and with 1 billion won in assets can borrow as much as 40 or 50 billion won to invest. In Korea, hedge funds can borrow as much as 400 percent of their assets, unlike their counterparts in advanced countries where is no leverage limit for them, which is like blocking the hedge funds from doing business. Under Kim’s management, hedge funds would have their leverage ratio expanded upward significantly, if not removed completely. The provision in the regulation requiring more than 500 percent of their assets in businesses up for restructuring would also be removed. The government will also support the growth of investment banks by merging a number of large securities and investment firms and by changing the operation of the Export-Import Bank and Korea Development Bank. 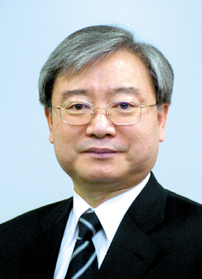 Chairman Kim Seok-dong of Financial Services Commission.